You know you’re not from Thailand when you flush a western style toilet in an air-conditioned apartment with bottled water. 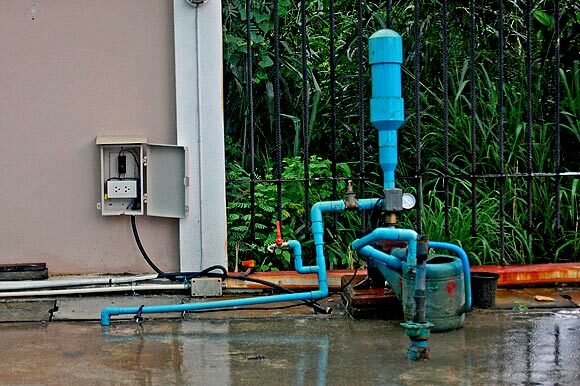 Last night, we lost water pressure in our Chiang Mai apartment. It was either due to thunderstorm or the pump burning out. While municipal water is treated (still unsafe to drink), it’s only pressurized enough to push it languidly to individual buildings. It’s up to the building owners to take it from there, either by electric pump on demand, or pumping it into rooftop cisterns so gravity can do its thing. This means that when power goes out so does the water. We left the apartment. Downstairs, we mentioned the problem to the manager. He apologized and explained the situation in good, but for some reason incomprehensible, english. We matched his smiles and graciousness in kind, but left confused over the cause and extent of the water problem. He made it seem like it was still working in Room 26 if we needed to take a shower. But Room 26 was occupied. Nearby is a little restaurant built under an awning of apartment building. It has no more than 8 small tables and one cook. She’s a friendly lady that cooks up some decent rice dishes. We sat, eating our fried rice. But I was haunted by the unfinished business in our apartment. I tried to push the thoughts out of my mind, but was unable. I felt like Beowulf. I had torn of Grendel’s arm and he had limpered off. But until I could flush him into the sewer, he could use his other arm kill me as I slept in the mead hall. 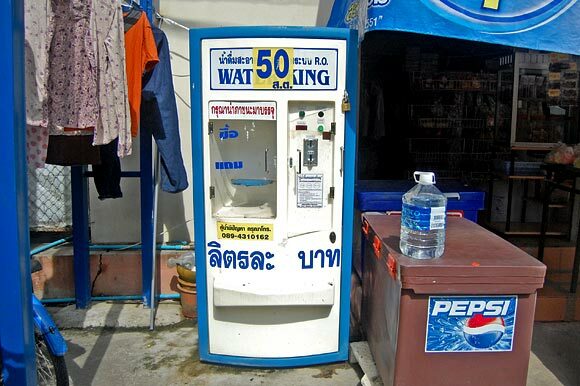 J. and I have been getting our drinking water from water kiosks. These devices are a new development since my last visit, and a much needed one. About every 4 blocks you can find one. For 1bht(3¢), you get two liters of filtered water. Before, I’d have to either buy tons of small bottles or lug heavy 20 liter bottles home (or pay to have it delivered). Now, I can just fill a 5 liter bottle whenever I want, nearby. Our water source: Water King. We paid our bill at the restaurant and walked home, passing a potential solution to my problem. I was determined to flush the toilet. Two trips to the kiosk later and I’d filled the toilet tank. I had one flush. It was my only shot. I pressed the button and closed my eyes. Woosh, gurgle, gurgle, gurgle. At that moment, there could be no sweeter sound. “Good job, Mr. Fancypants,” I congratulated myself. I had just flushed a toilet with bottled water. Of course, an hour later the water started working again. The new pump is loud and not confidence-inspiring. What I believe is the temporary replacement pump. It’s hidden behind the watering can. I have no idea what this device does. 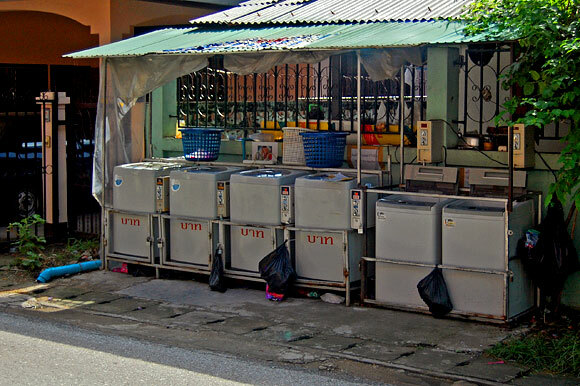 Another new addition to many Chiang Mai neighborhoods are public, coin operated washing machines. A few steps away from our apartment is a row of six. They are basically sitting on the street under a small awning. One load costs 10bht(30¢). As so few machines service a lot of people, they are often full. It’s an unspoken code that if a person comes to the machine and find it occupied but completed that person can remove the clothing and place it in a plastic hamper attached above the machine. When I stayed here three years ago, I had to walk down the street and have someone wash and dry clothes for me at great expense or hand wash them myself with a bucket in the shower. I have fond memories of washing clothes back then, even though I could never really get them clean. These “washing machines” as they call them are a pretty good idea. Clothes air dry in about a day if it isn’t raining. Our lease states that we can’t hang clothes from our balcony or curtain rods. We ignore this request and hang our clothes all over the apartment to dry. Even with the windows closed, they still dry in a day. 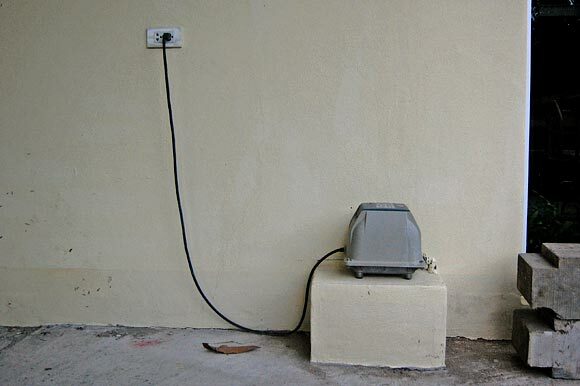 There aren’t many automatic dryers in Thailand; it’s easy to see why. i remember having my laundry done for me when i was there too. it might have been that my cleanliness bar was so low by then that anything would’ve impressed me, but i remember never having ever felt anything so clean as my tshirt when it came back from the laundry. they even folded it. i would steer clear of that mystery toaster device if i was you. I agree. I remember my clothes coming out so crisp and clean feeling too. I don’t know what they did differently. I almost felt bad to wear them again and undo the efforts of those miracle ladies.